Most professional conferences offer opportunities to learn from experts, meet industry peers, and ideally, find a little professional inspiration. But it’s not every conference that can boast great learning and networking opportunities plus whitewater rafting, scenic paddles, and a talent show to boot. River Rally, hosted by River Network and held in a different “river city” each year, is widely regarded by attendees as one fun conference. But the live music, educational field trips, films, and outdoor activities don’t make this conference any less serious. If anything, the fun elements encourage attendees to meet water professionals from around the country, from a wide range of academic fields, foundations, nonprofits, and business, while connecting with local waterways and experiencing them firsthand. At River Rally, attendees come together to learn from each other, address local and national problems, and tackle complex issues such as how best to encourage equity, grow stronger organizations, and expand impacts through scientific and technical approaches. 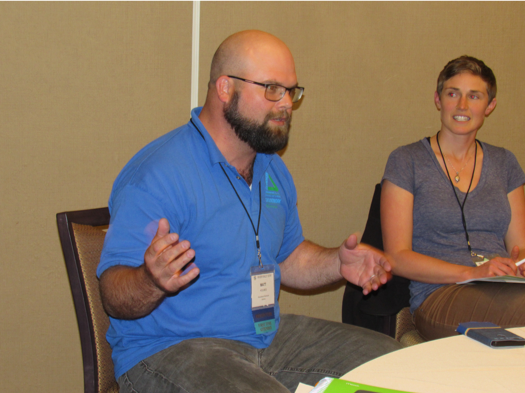 Matt Holmes from Groundwork Richmond (CA) and Andrea Savage from Groundwork Denver at the Urban Waters Learning Forum, April 29, 2018. 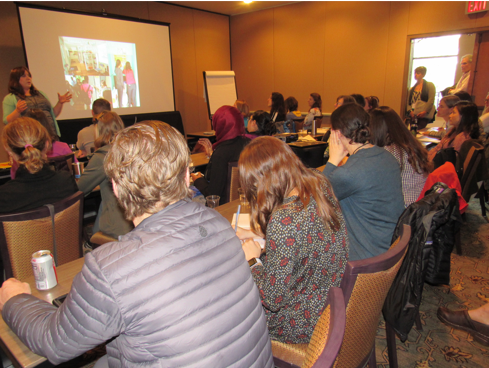 The day before Rally begins, the UWLN hosts a day-long Learning Forum at which urban waters practitioners from around the country meet their peers, attend expert panels, and discuss the topics they care about most. For the next few days of Rally, about 25% of workshops cover urban waters topics. Groundwork Trusts made an impressive showing at River Rally 2018, held April 28-May 2 in Olympic Valley, California, by the shores of Lake Tahoe. Representatives from Groundwork DC, Denver, Richmond (CA), Milwaukee, Hudson Valley, and New Orleans attended the Learning Forum and subsequent River Rally and led workshops in urban waters, resilience, and environmental justice. For a panel on “Developing Resilient Communities in the Face of Environmental Disasters,” Ramiro Diaz, Groundwork New Orleans Board President and architect at Waggonner and Ball, presented on the post-Katrina achievements and challenges leading up to the Greater New Orleans Urban Water Plan, which emphasizes the use of green infrastructure and community-based, innovative design solutions that “work with nature” and put “living with water” into practice. Groundwork New Orleans, with its multiple educational green infrastructure projects, is helping to advance this vision and actively working to build a more resilient New Orleans. 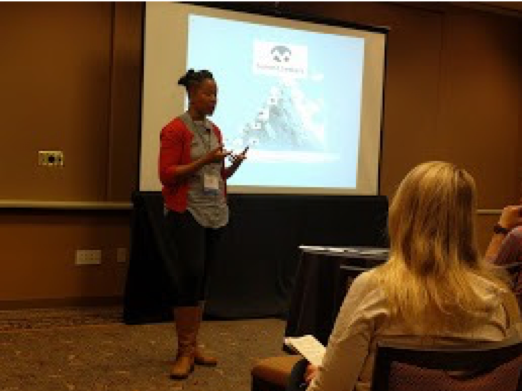 Ronda Chapman, Groundwork DC Executive Director, presents on the Summit Seekers initiative at River Rally 2018. Jennifer Sloan, Director of Education at Groundwork Hudson Valley, presenting GWHV’s climate change curriculum to a packed audience at River Rally 2018. Jennifer Sloan, Director of Education at Groundwork Hudson Valley, shared results from years of developing a NOAA-funded climate change curriculum focused on experiential learning for teens. Centered at Groundwork Hudson Valley’s unique and innovative Science Barge, the curriculum exposes youth from several regional public schools to promising green technologies through a series of field trips. The Science Barge is an off-grid vessel powered by and sporting examples of clean energy-such as a wind turbine and solar panels-as well as wastewater treatment and water catchment systems, hydroponic gardening, and more. The program has benefitted hundreds of youth and also hosts a variety of educational programs for adults and younger students. 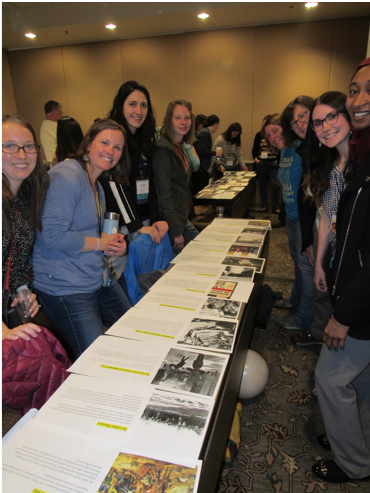 Workshop participants complete the Timeline Activity, a hands-on, interactive history building exercise from the Groundwork Environmental Justice Literacy Curriculum. Deputy Director Matt Holmes and Education Director Jen Fong of Groundwork Richmond (CA) shared hands-on activities from the Groundwork USA-supported Environmental Justice Literacy Curriculum, assisted by Rebecca Berry from Groundwork New Orleans and Andrea Savage from Groundwork Denver. The curriculum-which will be available for download by January 2019-is currently being developed by several Trusts throughout the Groundwork network. Emphasizing interactive learning and connecting history with current events, the curriculum can be adapted to a variety of situations and age ranges, accommodate many different learning styles, and help students solve environmental justice problems by organizing in their own neighborhoods. Through the Urban Waters Learning Network, Groundwork USA and Groundwork Trusts have established a valuable presence at River Rally. By sharing and exchanging knowledge with our peers, we have become thought leaders and champions for environmental justice in urban waters. And as we receive and incorporate feedback from practitioners in the field, we aim to grow and apply our new and improved knowledge in the communities we serve. –Maria Brodine is Groundwork USA’s Urban Waters Program Associate.